AgroAtlas - Relatives - Crataegus monogyna Jacq. - Common hawthorn, may. Crataegus monogyna Jacq. - Common hawthorn, may. Family Rosaceae Juss. genus Amelanchier Medik. Mespilus monogyna Willd., M. oxyacantha var. monogyna (Jacq.) Schmalh., Crataegus oxyacantha var. intermixta Wenz. Shrub or small tree, 5-10 m tall. Branches are fulvous-gray, with few straight thorns up to 1 cm in length, or sometimes without thorns. Leaves are tripartite or quinquepartite, often with very asymmetrically arranged lobes, which are usually connivent in the upper part. Leaf blades are obovate or oblong-ovate, trifid or largely dentate at the top, with glossy, dark, olive-green upper surface and light green underside covered with more or less dense waxy bloom, pubescent only at the corners of the veins. Flowers are arranged in oliganthous (10-18) inflorescences. Pedicels are bare or sparsely pilose. Corollas are white, up to 15 mm in diameter. Fruits are broadly ovoid or broadly ellipsoid, brownish red, with one kernel. Entomophilous. Ornito- and zoochore. Propagated by seeds and softwood cuttings. 2n = 32, 34. Central and southern Moldova and Ukraine, Crimea, European Russia (Kaliningrad region), and the Caucasus (western Ante-Caucasus). Mesophyte. Photophilous. Grows alone or in small groups on stony slopes (sometimes granite exposures) among steppe shrubs, on forest edges, in dry oak woods, less frequently in mixed pine deciduous forests on sandy soils or in hollows in the sands of lower river courses. Food (fruit), melliferous, medicinal and ornamental. Seedlings are habitually used as stock. Readily crossable with other hawthorn species. Brezhnev, D.D., Korovina, O.N. 1981. Wild relatives of cultivated plants in the flora of the USSR. Leningrad: Kolos, p.173. (in Russian). Poyarkova, A.I. 1939. 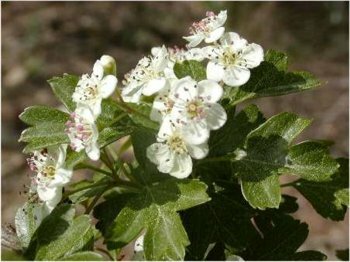 Hawthorn - Crataegus L. (Flora of the USSR.) Moscow/Leningrad: Publishing House of the USSE Academy of Sciences, vol. 9, pp. 454-455. (in Russian). Sokolov, S.I., Svjaseva, O.A., Kubli, V.A. 1980. Areas of distribution of trees and shrubs in the USSR. Vol. 2. Leningrad: Nauka, p.72. (in Russian). Copyright on the picture belongs to Jacint Ribas ( http://www.xtec.es/col-anunciata-cerdanyola/plantes ).